The Chemistry techs appear in the 2nd row of the left column in the Research menu. None. You have to research all the Chemistry techs if the game starts at Pre-Warp. This is a "general" tech level - even Uncreatives get all the techs. Ship Weapon that does 8 points of damage when it hits. All missiles travel at a combat speed of 8 + (2 x the number of parsecs the empire's drive travel per turn on the Galaxy map); that's 14 to 22 squares per combat turn. Modifications: (0) EMG if you have that tech; (1) ARM, FST; (2) MIRV. Enables ships to travel go up to 4 parsecs from your nearest colony. All ships are fitted with your best Fuel Cells automatically, so in effect they do not increase a ship's production costs or reduce the space available for other components. Ship Special System that increases a ship's range by 50%, but requires quite a lot of space (60). The most basic grade of ship-building metal, known in many forums as "cardboard" or "tissue" because such ships are ridiculously fragile. Enables ships to travel go up to 6 parsecs from your nearest colony. All ships are fitted with your best Fuel Cells automatically, so in effect they do not increase a ship's production costs or reduce the space available for other components. The range of existing ships is upgraded immediately and at zero cost. Twice as tough as Titanium Armor; gives ground combat units a +10% bonus; makes missiles and fighters tougher. The first armor that's fit for combat. 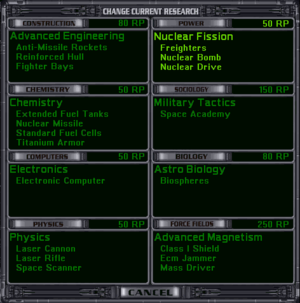 For non-Tolerant races the key is that you will very soon need Merculite Missiles (in the next Chemistry level), as they are far better than Nuclear Missiles — especially if your opponent gets Radiation Shield, which blocks most, if not all, damage done by Nuclear Missiles; the hidden secret is that the damage reduction is actually 5 + N, where N is the damage reduction by usual shields (N is the shield class). So if your opponent also has Class III or higher Shield, then Nuclear Missiles become completely ineffective against the planet with Radiation Shield. Even if the opponent don't have Class III Shield, you need huge amount of missiles, and it takes much more time; and their Missile Bases gleefully pound your ships with effectively infinite ammunition. You can't afford to wait for the next-level missile (Pulson Missile). If you plan to take Merculite Missiles at the next level, you forgo Pollution Processor. That means that, if your race is not Tolerant, you need Atmosphere Renewer (next level after Merculite Missile / Pollution Processor) for pollution control. So you can't have Iridium Fuel Cells (in the same tech level as Atmosphere Renewer) and therefore you need Deuterium Fuel Cells. All this means non-Tolerant non-Creatives take the risk of using Titanium Armor ("cardboard") until they research Zortrium Armor (higher up the Chemistry tech tree). Tolerant races need Merculite Missiles just as much, but they don't need any pollution control, unless they want to allow for conquering non-Tolerant colonies, in which case they follow route 1. They often take Iridium Fuel Cells later and Tritanium Armor now. Ship Weapon that does 14 points of damage when it hits. All missiles travel at a combat speed of 8 + (2 x the number of parsecs the empire's drive travel per turn on the Galaxy map); that's 14 to 22 squares per combat turn. Modifications: (0) EMG if you have that tech; (1) ARM, FST; (2) MIRV. Miniaturization: Decreases space used. Building that halves the effects of pollution. Best choice for non-Creatives: Merculite Missile (see previous discussion). Ship Weapon that does 20 points of damage when it hits. All missiles travel at a combat speed of 8 + (2 x the number of parsecs the empire's drive travel per turn on the Galaxy map); that's 14 to 22 squares per combat turn. Building that reduces effects of pollution by 75%. Cumulative with Pollution Processor (usually only Creatives get both), in which case pollution is reduced to 12.5%. Enables ships to travel go up to 9 parsecs from your nearest colony. All ships are fitted with your best Fuel Cells automatically, so in effect they do not increase a ship's production costs or reduce the space available for other components. The range of existing ships is upgraded immediately and at zero cost. For non-Tolerant races, Atmospheric Renewer. For Tolerant races, Iridium Fuel Cells if they chose Tritanium Armor earlier; otherwise (if they took Deuterium Fuel cells earlier) they may choose either Iridium Fuel Cells or Pulson Missile. Achievement that doubles the number of production units a planet can produce before any pollution is created. Unlike the other pollution control techs this one does not reduce pollution by a percentage. Achievement that increases all workers' production by +1 throughout the empire at zero cost. Twice as tough as Tritanium Armor, 4 times as tough as Titanium Armor; gives ground combat units a +15% bonus; makes missiles and fighters tougher. With this armor your ships are tough enough for mid-game war, especially if you have Class 3 or better shields (in the Force Fields tech tree). Best choice for non-Creatives: Zortrium Armor. This level is an important payday for Creatives: the "bonus techs" Nano Disassemblers and Microlite Construction make their workers almost as productive as a UniTol race's. Ship Weapon, the most powerful missile, does 30 points of damage when it hits. All missiles travel at a combat speed of 8 + (2 x the number of parsecs the empire's drive travel per turn on the Galaxy map); that's 14 to 22 squares per combat turn. The 2nd best armor you can research, 50% tougher than Zortrium; also gives ground combat units a bonus of +20%; makes missiles and fighters tougher. Enables ships to travel up to 12 parsecs from your nearest colony. All ships are fitted with your best Fuel Cells automatically, so in effect they do not increase a ship's production costs or reduce the space available for other components. The range of existing ships is upgraded immediately and at zero cost. Best choice for non-Creatives: depends on your strategy and overall situation, as your earlier techs (Zortrium Armor; Merculite Missiles, now fully modified and miniaturized by 3 levels) are pretty good. Zeon Missiles are excellent if your ships are mainly armed with missiles; even if you prefer "beams", Zeon Missiles make your Star Bases significantly more powerful. Uridium Fuel Cells can help you get at your opponents, but if there's an uncolonized system halfway you could gamble by sending an Outpost Ship and hoping there's at least a Gas Giant or Asteroid Belt which will allow you to create an Outpost. Since you probably want Adamantium Armor at the next level and therefore will forgo Thorium Fuel Cells, you may need to take Uridium Fuel Cells. Neutronium Armor is probably the least important option in most cases. Enables ships to travel an unlimited distance from your nearest colony. All ships are fitted with your best Fuel Cells automatically, so in effect they do not increase a ship's production costs or reduce the space available for other components. The range of existing ships is upgraded immediately and at zero cost. The best armor you can research, twice as tough as Zortrium; also gives ground combat units a bonus of +25%; makes missiles and fighters tougher. Best choice for non-Creatives: Adamantium Armor. The only better armor is Xentronium, which you can't research but may gain by beating Orion's Guardian or scrapping a captured Antaran ship (tactics that are often forbidden in multi-player games against human opponents), or by "obtaining" them from another player who has done one of these feats. If you're concerned about range, you should have chosen Uridium Fuel Cells at the previous level; galaxies in which Uridium Fuel Cells are insufficient are extremely rare. Very useful if your main weapons are Zeon or even Pulson Missiles (large numbers of EMG FST ARM MIRV Zeon Missiles are a terrifying avalanche); otherwise not really useful. This page was last edited on 18 March 2017, at 19:24. This page has been accessed 36,562 times.